RoyalBambino.com recognizes one stroller system that stands out for its many positive features and its ability to give you the best of all worlds – the Vista Stroller System by UPPAbaby! The Vista Stroller System is both a pram and a stroller! Featuring a completely interchangeable lie-flat bassinet and a stroller seat, with easy-to-read red and green safe attachment indicators, this carriage is suitable from birth and beyond. The Vista Stroller’s bassinet is fully lined with an eco-inspired blend of organic soybean and cotton fibers, so no synthetic fabrics touch your newborn baby, and all the fabric is removable and machine washable! The Vista Stroller System also has features designed with mom in mind! Large under seat storage basket, a hidden cell phone zip pocket, and new optional collapsible cup holder are just a few! Many new accessories have come out this year thanks to moms’ suggestions, and now the high-end luxury Vista Stroller System really has it all. UPPAbaby is an eco-friendly company, dedicated to creating a better environment for our children. Every stroller in their wonderful line is highly rated for quality and performance, and the Vista Stroller System is always at the top of the list! In 2009 it has been showcased on the Martha Stewart Show as a “Baby Must-Have,” and was featured on the Ellen DeGeneres Show during her Mother’s Day special. Invest in a high-quality luxury stroller that both you and your kids will love using to stroll around town! 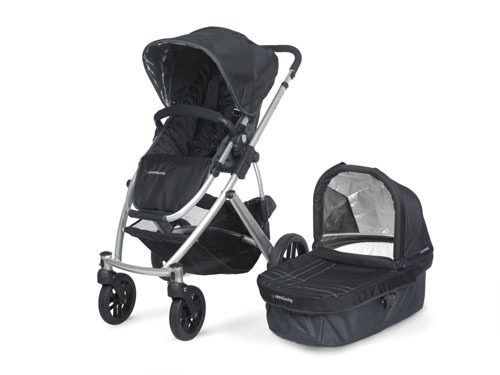 View the Vista Stroller System and the selection of UPPAbaby Strollers that Royal Bambino has to offer at RoyalBambino.com today!